The second novel in the Man Booker Prize–nominated author’s Seasonal cycle; the much-anticipated follow-up to Autumn (a New York Times, Washington Post, NPR, Financial Times, The Guardian, Southern Living, and Kirkus Reviews best book of the year). Winter. Bleak. Frosty wind, earth as iron, water as stone, so the old song goes. And now Art’s mother is seeing things. Come to think of it, Art’s seeing things himself. When four people, strangers and family, converge on a fifteen-bedroom house in Cornwall for Christmas, will there be enough room for everyone? Winter. It makes things visible. Ali Smith’s shapeshifting Winter casts a warm, wise, merry and uncompromising eye over a post-truth era in a story rooted in history and memory and with a taproot deep in the evergreens, art and love. ALI SMITH was born in Inverness, Scotland, in 1962 and lives in Cambridge, England. She is the author of Autumn, How to be both, There but for the, Artful, Free Love, Like, Hotel World, Other Stories and other stories, The Whole Story and other stories, The Accidental, Girl Meets Boy and The First Person and other stories. Hotel World and The Accidental were both short-listed for the Man Booker Prize and the Orange Prize. How to be both won the Baileys Women’s Prize for Fiction, the Goldsmiths Prize and the Costa Novel of the Year Award, and was short-listed for the Man Booker Prize. 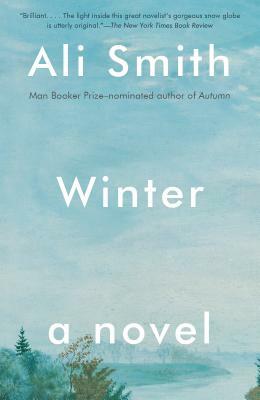 Autumn was short-listed for the 2017 Man Booker Prize.